My mom introduced me to mystery books when I was a girl - in fact, the first books I really remember being interested in were the "Encyclopedia Brown" mystery books. I rented every single copy our library had, and I've been hooked on mystery and suspense novels ever since. 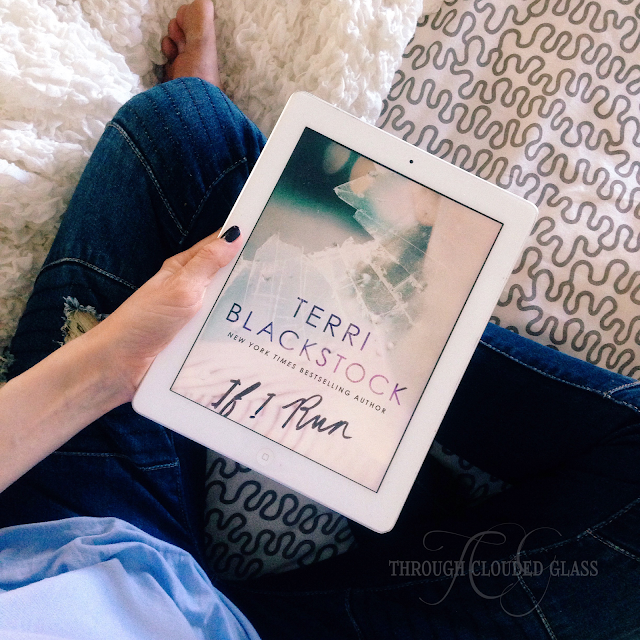 Terri Blackstock has long been one of my favorite mystery/suspense authors, so I was excited for the opportunity to review the first book in her new series, If I Run. This book grabbed my attention right from the first paragraph, when Casey Cox discovers the body of her murdered friend and immediately goes on the run. You aren't sure why at first. It sucked me right in. As the story develops it is told in the first person from the perspective of two characters, Casey and a private investigator that is hired to track her down, Dylan Roberts. As Dylan tries to understand Casey in order to find her, we start to learn that there is something fishy going on. I don't want to say too much so I don't ruin the suspense, but I loved the characters in this book. They were smart and troubled, but believable. Sometimes I have to force myself to finish a fiction book, but that was not the case here - the entire book was enjoyable. The plot line kept me interested from beginning to end, and I appreciated a secondary mysterious situation that was worked into the story. This secondary plot was resolved at the end, even while the book ended on a cliffhanger, which I thought was a very smart way for Blackstock to bring some resolution to the book while continuing the story. And the fact that is it ended on a cliffhanger is making me anxious for the next book to come out! If you are a fan of mystery or suspense books like I am, this is definitely a series to check out! Note: I received a copy of this book for free from Litfuse Publicity Group. This is my honest opinion. Check out this giveaway too! 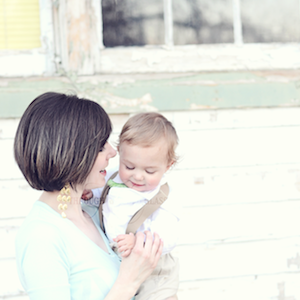 If there is one thing I have learned about motherhood, it's that we all transition into it differently. Some sail into motherhood on a cloud. Everything comes easily, and they enjoy every minute of it. Others crash into motherhood with a rude awakening, and it looks nothing like they thought it would. But every mom I know would say how much she loves being a mom, and one look into those precious little faces just puts everything into perspective, no matter the entrance into this mothering journey. Still, I can guarantee there will come a time when you need some encouragement as a mom. Maybe it's right away when you just need to make it through one more sleepless night, or maybe it will be a couple years down the road when you have a rough day and worry you are messing your kids up. Sometimes you just need that extra boost to remind you that the work you are doing has significance. Every ounce of energy you put into you kids matters, more than you think. It matters to your kids, and it matters to God. So to help remind you, I wanted to share some Bible verses that I find encouraging on those days when mothering is hard. If you are in a rough patch, I hope these will bring you some hope! And if you are feeling like you have this mom thing down, just tuck this post away for a time when it doesn't feel so easy. I have broken these down into times of day - I know I need different reminders in the morning than I do in the evening. Memorize these verses so you can bring them to mind when you need them (you can even teach them to your kids while you are at it)! I love this verse for rough days, because it reminds me that no matter how badly I mess up, the Lord loves me and tomorrow is a fresh day. The best wake-up verse you could ask for! When you look at the cute little faces of your children, remember that the Lord loves you even more than you love them! Motivation to keep going strong - because when we are serving our families, we are really serving Jesus! When you are starting to feel "the witching hour" (i.e. the hour before dad gets home when everyone goes crazy), remember this verse. I don't know about you, but I want to be a light in the world, and be an example to my kids by not grumbling when I feel like it. Still working on this one. Rejoicing usually comes more naturally in the morning when I am refreshed and energetic! 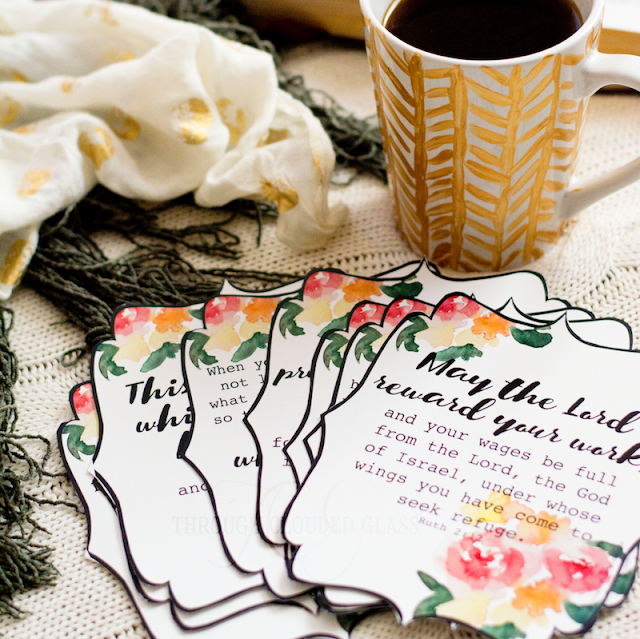 I typically need the reminders to rejoice and give thanks more in the evening, when I am tired. This verse is about giving to the poor, but the concept of being seen by God when we give sacrificially without drawing attention to ourselves is also encouraging to me as a mom. 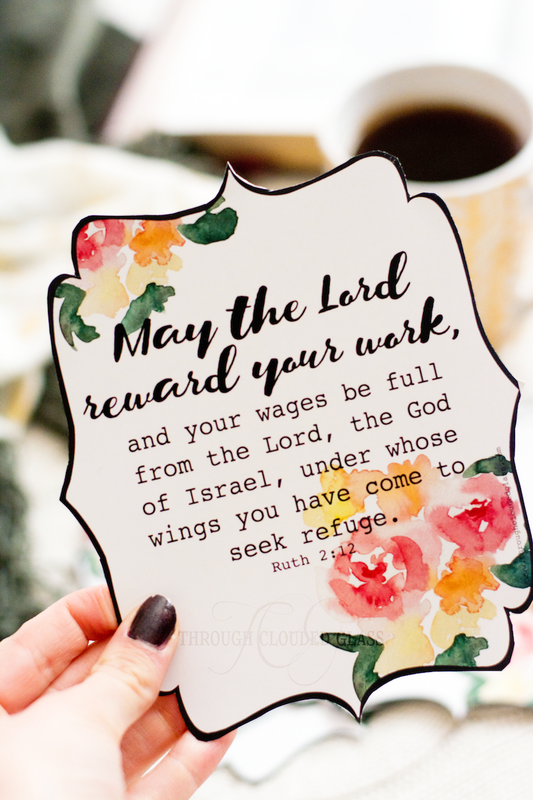 My prayer for you, friends! Seek refuge in Him, be faithful in this work of loving and training your children, and may the Lord reward your work! 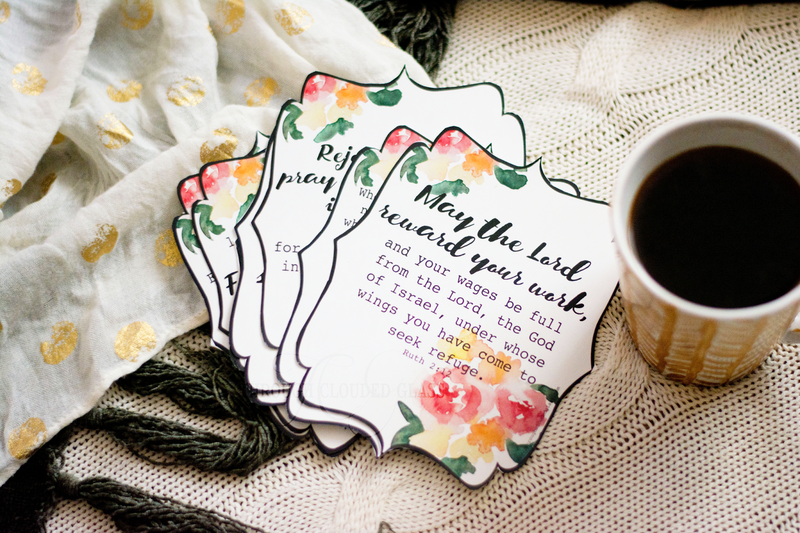 Somehow I find it easier to remember a verse if it is printed on a pretty card, and I am excited to now be offering these printables in my new Etsy shop! The file with the entire set is only $3! Please check them out here. These cards also stack well with my printable verses for labor. 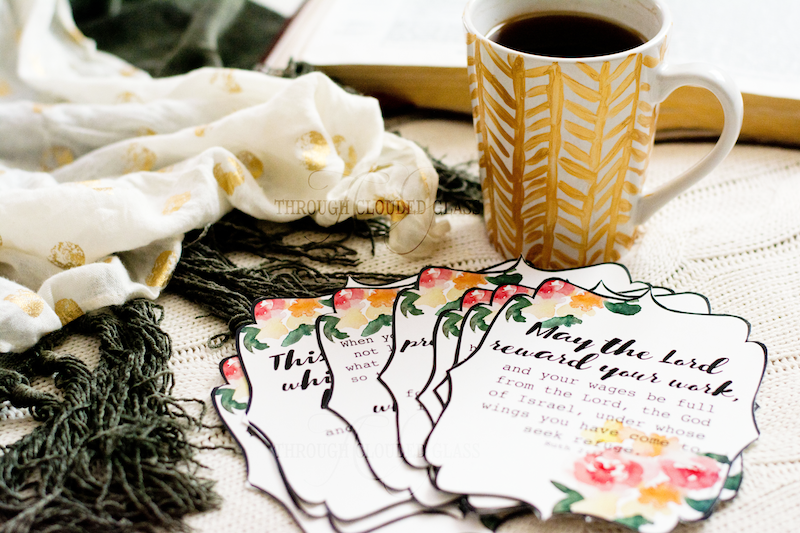 I am so grateful for all of you who take time to read my musings, and I hope you enjoy these cards and find the verses an encouragement like I do! Enjoy! 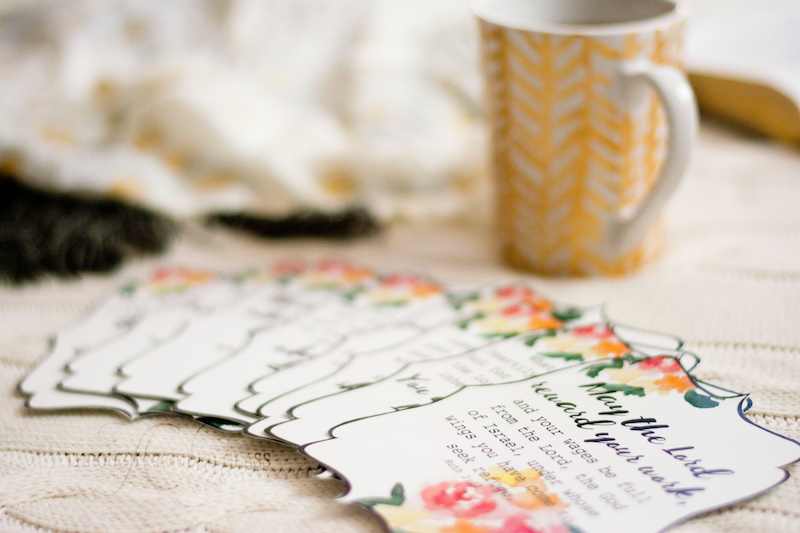 Please note that these printables were previously offered as a gift to my newsletter subscribers before being listed on Etsy. 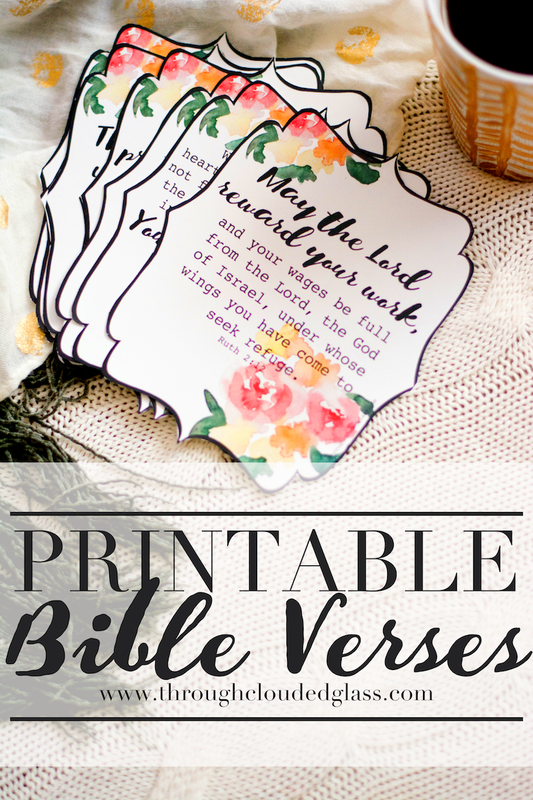 They are no longer available as free printables, but are available for immediate download after purchase at the link above. Thank you! I'm sitting down with a bowl of salad and scrolling through my Facebook feed. I have carefully curated my feed to make sure that I will only see updates that I want to see - updates on what my good friends are doing, pictures of their cute kids, interesting articles. I have blocked all complain-y posts and I'm not friends with anyone who annoys me, so it's about as harmless as a Facebook feed can get. But as I scroll, there is a small knot in my stomach that twists a little. Oh, she got to go to Hawaii? How fun is that? Why can't we afford Hawaii? Oh my goodness, look at her adorable baby. Perfectly styled, no less. I need to buy new outfits and take new pictures of the kids. Oh, the newlyweds are on another date night. I think they've had about five date nights since Derek and I went out last. Was that three or four months ago? Suddenly I am feeling a little jealous and much less content with my life. And you know what, I can't even blame my Facebook feed - it's carefully curated, remember? I want to see this stuff. No, the problem isn't with social media or anything else. It's with me. I have a comparison problem. I know I am not the only one who struggles with comparison - this is a hot topic. But no matter how many articles I read on the subject, no matter how much I am reminded that I have it pretty darn good too, it is still hard not to let that knot twist me into a discontented mess. 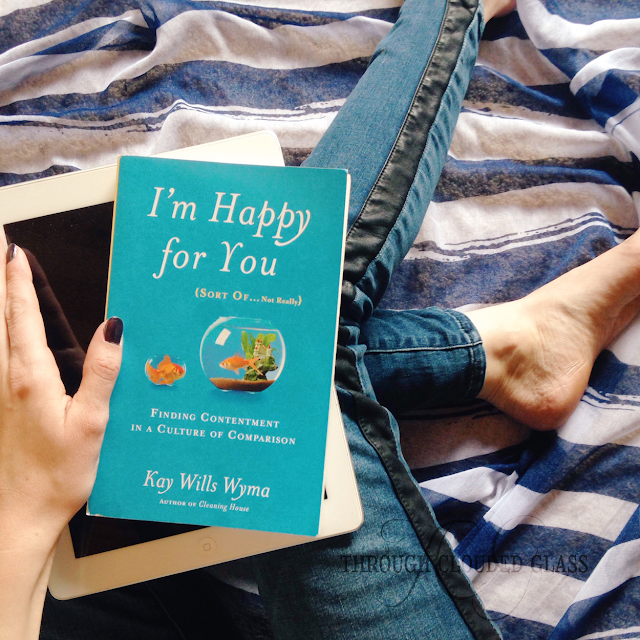 I was excited when I saw a book available for review called "I'm Happy For You . . . Sort Of . . . Not Really" by Kay Willis Wyma. Don't you love that title? I'm not going to lie, I have secretly had those feelings in that exact order. Many times. This book was so helpful to me in this struggle with comparison. As I was reading through it I was more aware of comparison than I normally am, and I realized just how much it affects my day-to-day happiness. When I am so focused one what everyone else is doing, it's harder to be happy for the things I have, and this book brought sharply into focus for me. The chapters addressed different areas of comparison and reasons why this is such a struggle in our modern culture. One thing that stood out to me in this book is that comparing to others is the way we can be sucked into the sin of coveting. Whenever we desire something that someone else has (often through comparing what we have to what they have and coming up wanting), we are coveting. Comparison doesn't just "steal our joy", it is also a gateway into sin. I love the solution this book offers to the comparison problem - to say "I'm happy for you" and mean it. Without a hint of sarcasm. It's not easy to do, but the book made me realize that being happy for someone isn't just something I feel, it is something I actively choose to do. It's hard to pick a favorite chapter because the whole book was so good, but I really appreciated the chapter on the need to belong. This chapter was a good wake-up call to me that people want to feel known. It should have been obvious to me, because I know that I want others to notice and encourage me - so of course other people want the same. I felt challenged to look at those around me with fresh eyes, notice what makes them unique, and maybe even tell them. I want to be the person who can make someone else feel noticed and special. Since I started reading this book I have been trying to truly be happy for those around me. So when I scroll through my Facebook feed, my goal is to turn off the train of thought that will lead me to be jealous of my friends, and instead smile to myself at their blessings. And the one thing that has helped me most in overcoming the comparison game? I like the status update and comment with something encouraging. It is really hard not to be happy for someone when you focus on crafting a non-sarcastic, truly happy comment. It's the perfect solution because it encourages them, and I feel my own heart changing in the process. It's a chance to slow down and remember that I do really care about this person, and I am really happy for them, regardless of my own situation. It takes my eyes off me, and puts it onto others - and maybe even directs my mind to God as I shoot up a "thanks for blessing my friend" prayer. So the next time you find yourself feeling a little jealous as you scroll through your social media feed? Type out a nice comment and mean it. I know it's made Facebook a lot more fun for me! 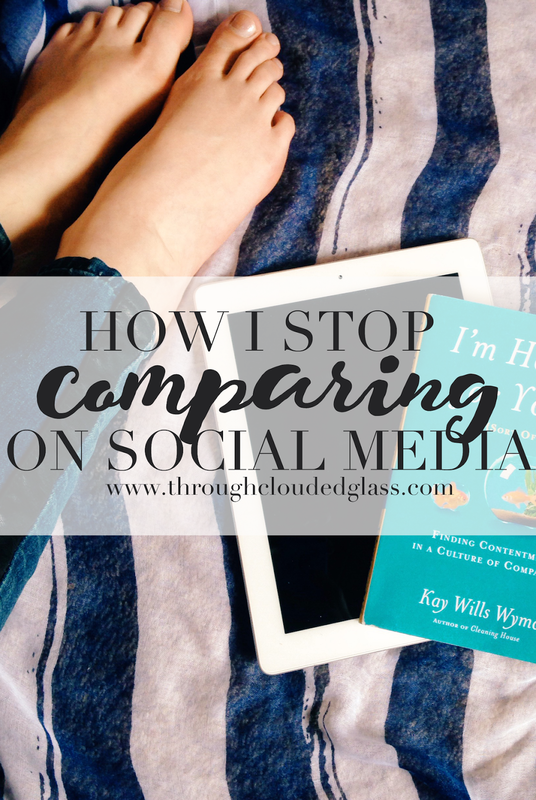 Do you struggle with comparison and jealousy on social media? What do you do to overcome it? 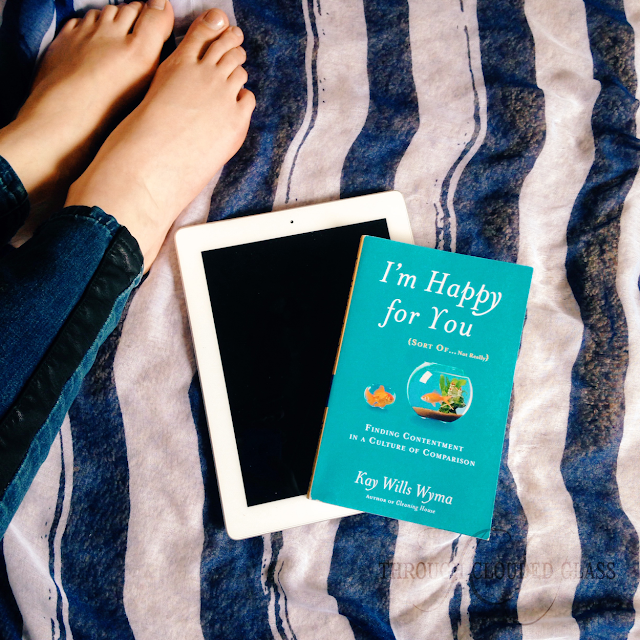 Note: I received a copy of "I'm Happy For You" for free in exchange for a review. This is my honest opinion. Am I the only one who gets my best ideas while I am falling asleep? I heard there is a scientific component to it. All day your brain is gathering information and recording your life, but it doesn't have time to process everything and solve problems until you give it a chance to rest. So right as you are drifting off to sleep you brain starts to put it all together, and you think of your best ideas. On the night of December 30th I stayed up far too late, scrolling through my social media feeds. 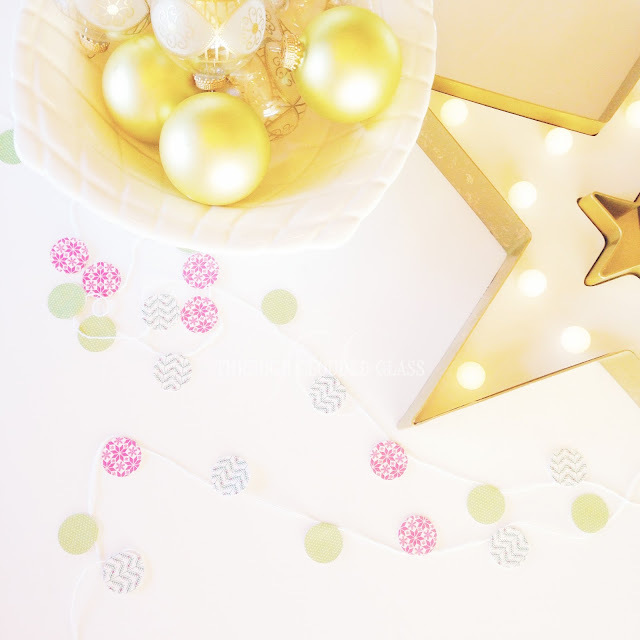 I read so many inspiring posts from people about their words for the year, and why they chose them. I had been trying to think of my own word for 2016 for the last couple weeks, and the last two days of December are crunch time. I was processing, I was reflecting, I picked and subsequently threw out five different words. Finally it was all too much, and I just put the phone down, and closed my eyes. I prayed again for some direction on my word for the year, and started to feel my thoughts fade. I was a bit taken aback, not by her question, but by the tone. We have been asked many times since having Clarice if we think we will have any more. I know people are curious, because it is unusual to have four kids these days (even though really, it’s not that many, people!). But this seemed more in-your-face than the normal questioning. I knew as soon as I uttered that second word that it was a mistake this time. Yes. Derek and I are very happy with four kids, and that’s all we ever really talked about having. We are done. I guess when you already have four kids people expect you to know 100% whether you are having any more. But lately, every time I am asked, I can’t quite make myself drop the “probably” from my answer. Can I tell you something? I am not a crafty mom. I realized this a couple years ago, when Wyatt came home from church one week requesting that we do a craft. 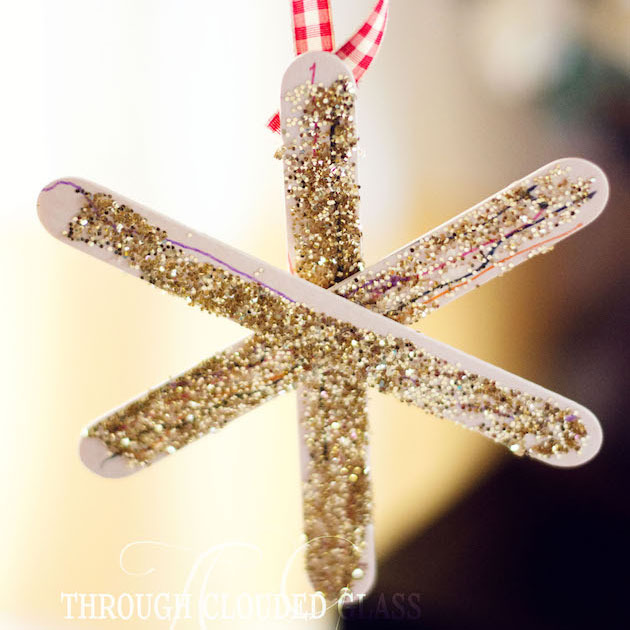 He had been doing crafts in class, and to his little mind it made perfect sense to bring the fun home. I assured him we could do a craft, but as I wracked my brain for an idea of something we could do together, I realized that I had nothing. One of my favorite things about Clarice is her feet. I just remember looking at her little feet when she was born, and they were so dainty. One of my favorite things to do is put her in the baby carrier and grab those little feet with my hands. They are so tiny, my palms just wrap around them. I grabbed her feet a few days ago, and as I felt her delicate toes, I realized that her feet had grown. Still dainty. But now the arch of her foot doesn't nestle into the space between my thumb and finger quite the same way. Obviously she needs to grow, but it doesn't stop me from wishing her feet would stay tiny forever. I promised myself I would get out of bed early. No more letting the kids wake me up - I made a deal with them. I would come upstairs as soon as it gets light outside, if they would just stay in their rooms until then. I didn't think this was unreasonable. I had about a half our left to sleep when I heard Clarice cry - I went to get her and I settled back in bed to feed her, hoping to snooze before my dawn deadline. I made it ten more minutes before I heard Gwen on her way down the stairs, and Wyatt calling to remind her that she is supposed to stay in her room. I rushed to put Clarice back in her crib while her eyes were still closed, but it was too late. By the time everyone was settled back in bed I had about five minutes before the sun peeked over the horizon. I had to keep my end of the deal in hopes that the kids would do better tomorrow, so upstairs I went to get the big kids some breakfast. Even though I tried to fight it, the rest of the morning was kind of like that. Water all over the bathrooms counters. Cheerios stuck to Clyde's shirt. Crying, and yelling, and laughing, and never-ending questions. Chaos, beautiful because it is brought by these four precious children of mine, but chaos nonetheless. My carefully laid plans foiled at every turn. Almost every day looks like that right now. You want to know what my word was for 2015? Simplify. Ha. Ironic, is it not? This past year, I understood for the first time why some people don’t like watching the news. I have always been a bit of a news junkie. Part of this may have come from being a dental hygienist. People are nervous at the dentist, and it helped to have some outside interest to divert their attention from their vulnerability and the dental poking and prodding that was coming. With current events, we are all in it together. I used to hate it when a patient brought up a story I had heard nothing about. All I could say was “Oh really?”, which is not much of a distraction from the despised plaque-scraping. I like to feel informed, I like to be able to contribute an opinion to the conversation, so I still turn on the news each morning and keep my radio dialed to talk stations. But in 2015, the news was heavy and dark, and for the first time I felt the weight of it. ISIS, persecution, refugees, Planned Parenthood atrocities, Supreme Court decisions. The world is changing at a rapid pace, and I don’t know if I want to watch where it’s heading anymore. 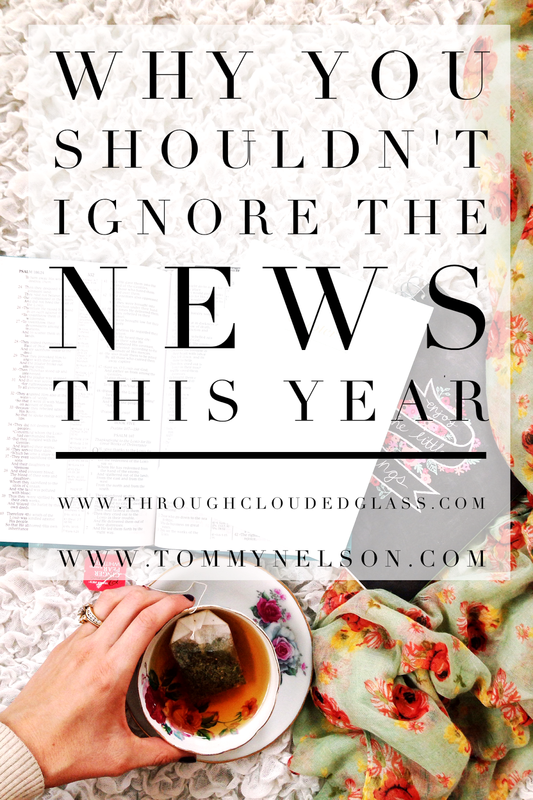 I’m no longer working as a hygienist, so I no longer need to keep up on the news for my patients’ sakes. It’s terribly tempting, as we head into another blank year on the calendar, to bury my head and ignore all the “negativity”. But I won’t, because I know it would be irresponsible of me to do that. The world is spinning out of control, the country as a whole is turning it’s back on God more each day, and people are going their own way. But it’s not too late for things to change. If I didn’t believe that, I would bury my head and hunker down in my house with my family until Jesus comes back. We are not to the point of no return, but change in the world will only come through something that only those of us who follow Jesus can accomplish - prayer. I have a little confession - I used to secretly think that there was little practical point in prayer. Nothing can thwart God’s will. Sure, there are benefits of prayer on our relationship with God, but I doubted whether prayer really changed anything else. Through a recent in-depth study at our church, I’ve come to realize that God chooses to use our prayers as a catalyst to accomplish His work on earth. His will is that we pray, and He chooses to involve us in bringing about His will through our prayers. It’s kind of cool actually, that He chooses to include us, because He didn’t have to set it up that way at all. That is why prayer is powerful. Because God allows His will to be worked out on earth through prayer. As I watch the news now, I realize how desperately our world needs prayer. 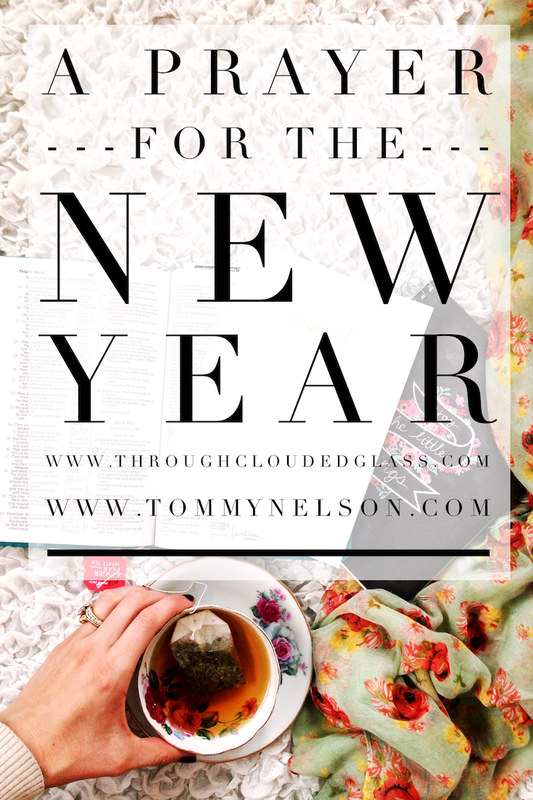 So what is my prayer for 2016? I pray that God will bring about a great revival, and that it will start within our own families. We turn on the news, and it is easy to see how mainstream culture has forgotten the things of God. But I wonder how much of that same attitude has seeped into our families? Do we turn to God with our struggles and sorrows, or do we try to find our own solutions? Do we take our concerns about our world to Him, or do we turn the channel and try to forget what we saw? Are we modeling the truth of prayer for our kids, or just going through the motions? There will be no revival in this country without a revival of prayer. God tells us that the fervent prayer of a righteous man accomplishes much, and it is time for those who follow Jesus to pray fervently for hearts to turn back to God in our nation and world through each situation we see on the news every day. In 2015, I had to practice taking that heavy, dark feeling and shining the light of prayer on it. 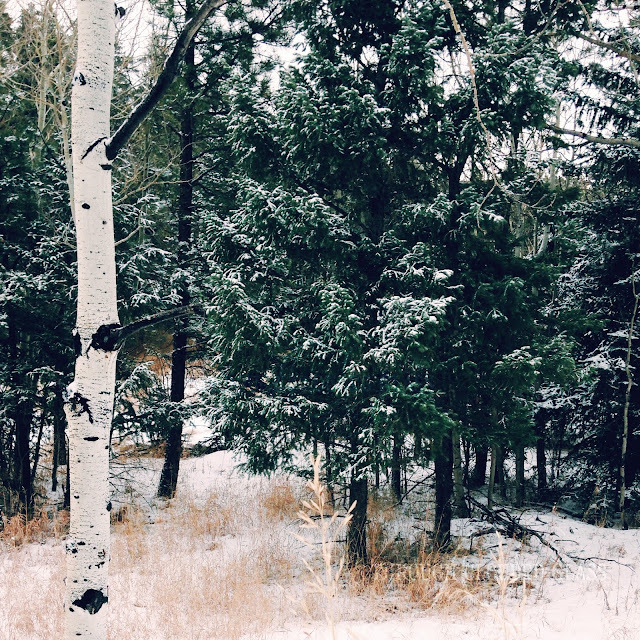 In 2016, I want to pray more fervently that God would use the darkness to emphasize His light all the more. I pray that in the midst of these scary days in history, God would draw people to Himself. I pray that He would use me and my family, in whatever part of His story we must play, to bring our country back to Him. Will you join me in praying for our nations as we start 2016? I don’t know what this new year will hold, but I do know that the future looks brighter when we turn our faces to Jesus. Lord, we need Your help. We have all turned aside to our own paths, and there is none of us who is without sin. Thank You for sending Jesus to pay for our sins. Thank You that when we believe in Him, You cover us with His righteousness. Lord, forgive us when we forget that in the midst of these scary times, You are our Hope. Help us to remember to turn to You with our fears. I pray that You would bring about a revival in America, the greatest one in our history, and that You turn people here and around the world back to You. Forgive us for our own failure to turn to You and our passivity in the face of evil and suffering. Please work in our own hearts to put You first, and to obey Your voice as we try to shine Your light in the darkness. May we all do the work that You have for us in 2016, and give us the strength to be fervent in prayer.